Studio042 is Proud to honor Elijah Robinson, MHS'15, with donated banners to the ‘Fuzzy’ Furlong Field House, a testament to his hard work and inspiration for the Montclair HS football program. Elijah Robinson, MHS class of 2015, honored with banners in the Field House weight room. 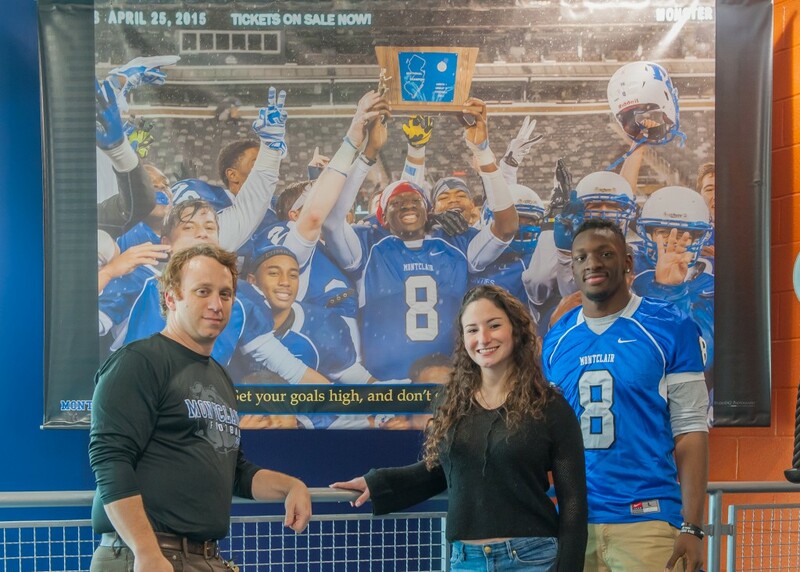 L-R: Eve Mahaney, AD Jeff Gannon and Elijah Robinson at the Field House for the unveiling of the banners. Photo by Scott Kennedy for The Montclair Dispatch. For many teams and athletes, the ultimate goal is immortalization within their sport. Athletes are consistently motivated by the opportunity to make their mark on the sport that they work so hard for. Montclair High School has produced great teams. From the nationally competitive rowing team to the swift and formidable girls soccer team, Montclair has seen the rise of some of the most dominant New Jersey teams. Perhaps none more so than Montclair High School’s football team and Elijah Robinson MHS’15, a regionally commanding program with a penchant for making themselves known. Luckily, this hasn’t been a problem with the help of Studio042, Montclair’s revered photo and printing business. Utilizing their dedicated and talented employees, the studio created banners for the Furlong Field House to commemorate the historically successful class of 2015 football team. “Elijah [Robinson] simply represented what we expect of all of our student athletes. He was dedicated to his development in the classroom and on the field, and he was dedicated to supporting his teammates’ growth as well. People often think it was effortless for him to do all of these things, but that would take away from his tireless work ethic, [which is] the quality I think people admire the most about him,” said Jeffrey Gannon, Athletic Director and Assistant Principal for Athletics and Student Activities of Montclair High School. Elijah Robinson Graduated with a 3.98 GPA and as a Member of the National Honor Society all while racking up an impressive book of statistics. According to the Boston College Athletic Department Elijah’s public high school records are: Recorded a 23-1 record as a starter, amassing 6,431 all-purpose yards and 84 touchdowns in two seasons … helped Montclair to three state titles, going 35-1 as a varsity player … named New Jersey Player of the Year by the Maxwell Football Club … earned first-team all-state honors, Essex County Player of the Year accolades and was the stateís fifth-leading rusher with 1,842 yards while completing 67-of-141 pass for 1,699 yards in senior season … also responsible for 41 total touchdowns … named a captain in final season … named Essex County Player of the Year and earned first-team all-state, All-Group 5, and All-Essex County honors as a junior while throwing for 1,464 yards and 21 touchdowns with only four interceptions. Elijah left High School Early in January to start college at Boston College playing for the Eagles as a Wide Receiver. It is fitting that his Jersey number out at Boston is #1. Elijah is currently a theology major in the Morrisey College of Arts and Sciences. After years of state championships and state records being set, Studio042 decided to donate the two banners to the Field House, as a thank you for the hard work and commitment from Montclair Football’s staff and players. The banners were installed within the Field House weight room, as a symbol of confidence and determination for the future classes of Montclair football. Eve Mahaney, the employee that was chosen to lead the project, spent two years as manager of the team and is renowned as the unofficial team photographer. Thanks to Mahaney, many players over the years have been able to remember and relive their finest on-field moments thanks to her photography. This led to her being comfortable and self-assured leading a project that required her to choose pictures from Studio042’s photo collection that would embody the team’s core values for years to come. Eve Mahaney is now a Sophomore in the Roy H. Park School of Communications at Ithaca College, majoring in Cinema and Photography B.S., concentration in Still Photography.. Eve is also a Staff Photographer for The Montclair Dispatch. 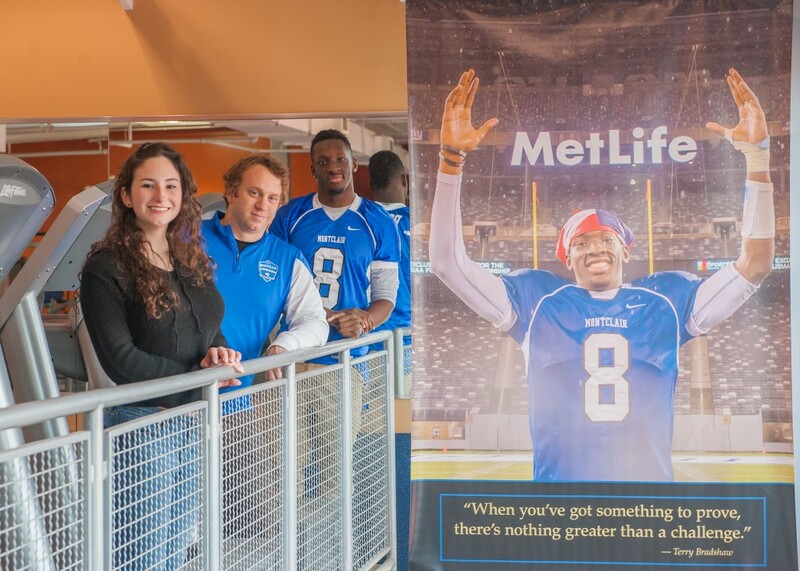 L-R: AD Jeff Gannon, Eve Mahaney and Elijah Robinson at the Field House for the unveiling of the banners. Photo by Scott Kennedy for The Montclair Dispatch. As for the team, the players that were commemorated couldn’t be happier. The banners feature celebratory pictures of many players after they won the most recent North 1 Group 5 State Championship, along with motivational quotes from the likes of football greats Bo Jackson and Terry Bradshaw. And remembered they will be. Studio042’s donation is not only a symbol of the diligence and commitment that the Montclair Football program traditionally shows, but it also serves as evidence of the tremendous support system Montclair athletes find themselves benefiting from. Institutions, small business and town leaders from Montclair form an unrivaled backbone that enables the athletes of Montclair High School to achieve and dominate, as we have done for so many years.